William James (January 11, 1842 – August 26, 1910) was an American philosopher and psychologist who was also trained as a physician. The first educator to offer a psychology course in the United States, James was one of the leading thinkers of the late nineteenth century and is believed by many to be one of the most influential philosophers the United States has ever produced, while others have labelled him the "Father of American psychology". Along with Charles Sanders Peirce and John Dewey, he is considered to be one of the greatest figures associated with the philosophical school known as pragmatism, and is also cited as one of the founders of the functional psychology. He also developed the philosophical perspective known as radical emp William James (January 11, 1842 – August 26, 1910) was an American philosopher and psychologist who was also trained as a physician. The first educator to offer a psychology course in the United States, James was one of the leading thinkers of the late nineteenth century and is believed by many to be one of the most influential philosophers the United States has ever produced, while others have labelled him the "Father of American psychology". Along with Charles Sanders Peirce and John Dewey, he is considered to be one of the greatest figures associated with the philosophical school known as pragmatism, and is also cited as one of the founders of the functional psychology. He also developed the philosophical perspective known as radical empiricism. James' work has influenced intellectuals such as Émile Durkheim, W. E. B. Du Bois, Edmund Husserl, Bertrand Russell, Ludwig Wittgenstein, Hilary Putnam, and Richard Rorty. Born into a wealthy family, James was the son of the Swedenborgian theologian Henry James Sr and the brother of both the prominent novelist Henry James, and the diarist Alice James. James wrote widely on many topics, including epistemology, education, metaphysics, psychology, religion, and mysticism. Among his most influential books are Principles of Psychology, which was a groundbreaking text in the field of psychology, Essays in Radical Empiricism, an important text in philosophy, and The Varieties of Religious Experience, which investigated different forms of religious experience. 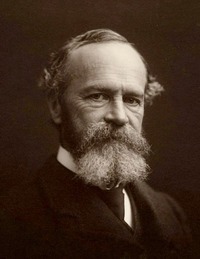 William James was born at the Astor House in New York City. He was the son of Henry James Sr., a noted and independently wealthy Swedenborgian theologian well acquainted with the literary and intellectual elites of his day. The intellectual brilliance of the James family milieu and the remarkable epistolary talents of several of its members have made them a subject of continuing interest to historians, biographers, and critics. James interacted with a wide array of writers and scholars throughout his life, including his godfather Ralph Waldo Emerson, his godson William James Sidis, as well as Charles Sanders Peirce, Bertrand Russell, Josiah Royce, Ernst Mach, John Dewey, Macedonio Fernández, Walter Lippmann, Mark Twain, Horatio Alger, Jr., Henri Bergson and Sigmund Freud.